The current project we are working on with Kenya Red cross in Walda, Marsbit County is the equipping of four high yielding boreholes that are specifically for water supply to the communities but more so for irrigation of farms that Red Cross has helped set up. This translates to food security and preparedness for the adverse weather conditions often experienced in this region. 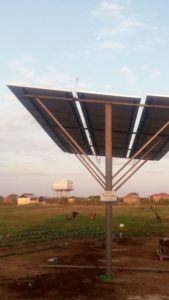 Due to the high costs of running the boreholes on diesel, Epicenter Africa provided a Solar Power solution that made it possible for these communities to irrigate there fields throughout the year.